A woman was left with horrific injuries to her arm after she was attacked by an out-of-control dog. The victim, a 44-year-old woman, was walking past a bus stop on Kensington Road, opposite Hawkins Street, when an aggressive dog ran up to her and bit her arm. The male owner of the dog made unsuccessful attempts to remove the dog before the victim broke free. 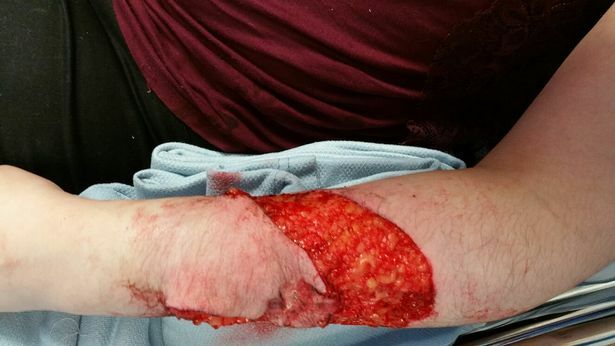 She sought treatment at hospital for what police called "life-changing injuries", which required skin grafts on her arm and will leave her permanently scarred. The incident happened at around 1.25pm on Thursday, September 15. The owner of the dog was described as a white, of medium build, aged between 28-35 years, with long curly dark hair. He was wearing a white baseball cap and a light coloured tracksuit. The dog is described as BLACK WITH A LARGE HEAD AND LARGE BUILD. Inspector Ian Kavanagh said: “It is a criminal offence to allow a dog to be dangerously out of control so we would appeal for anyone who can help us trace the owner to contact us with that information. “ Police patrols did search the area for the dog and owner and neighbourhood officers will be keeping an eye out for it so that the owners can be spoken to about this incident. Anyone with any information on the incident, or who recognises the description of the dog owner and dog, is asked to contact Merseyside Police on 101 or Crimestoppers, anonymously, on 0800 555 111. Nutters are such tough guys, until their pibble rips apart someone's arm. Rather than face the consequences, they slink off into obscurity. When their pit bull does this again, they can say, "It's never shown any sign of aggression before". Well, at least there's no paper trail.